Dandruff can usually be treated with “anti-dandruff” shampoos. Seborrhea dermatitis can get worse with stress and when the weather is cold and dry. Dandruff isn’t a serious condition and it’s not contagious, but those annoying white flakes can prevent you from wearing your favorite shirt. There are many effective and available treatments without a prescription and for severe cases, prescription medicines may be ordered by your primary health care provider (PCP) or dermatologist. Dandruff is the name of a chronic scalp condition and it is also the name of the fine, white flakes that are visible on the scalp. The flakes may be white or light yellow. They often fall from a person’s scalp when the hair is touched, rubbed, or brushed. The main symptoms are itching and many flakes from a person’s scalp. Dandruff can be mildly annoying (light dandruff flakes) to super annoying when the itching is severe and/or there are a lot of flakes. Some people can also have red irritated areas on other areas of the body, such as the inside of their ears, eyebrows, or other areas of the face. Dry skin: This can happen during the winter when the air is very dry and it may go away during the summer. The flakes are usually small. You may also notice similar dryness on other parts of your body, such as your legs and arms. Irritated, oily skin: This is sometimes called seborrheic dermatitis. It affects not only your scalp, but also may affect areas in your body with many oil glands. For example: the eyebrows, sides of the nose, back of the ears, breastbone, armpits, or even your groin area. Not shampooing enough: Your scalp skin cells naturally die and shed. Sometimes they can also get trapped in oily clumps. If you don’t shampoo regularly, these clumps may build up–causing dandruff. Sensitivity to a scalp fungus: A fungus called malassezia naturally lives on healthy scalps without causing problems. In certain people this fungus can irritate the scalp causing redness and oily patches of white flaky scales that resemble seborrheic dermatitis. Reaction to certain hair products (contact dermatitis): Certain ingredients in hair care products or hair dyes can cause irritation of the skin. This results in a red, itchy, and scaling scalp. This is especially common to those with sensitive skin. There’s no specific test used to diagnose dandruff, but flaking skin and itchiness are the main symptoms. Your health care provider or dermatologist can tell if you have dandruff just by looking at your scalp and skin. Dandruff is very common, just about anyone can have it. It can start anytime but it is especially common during the pre-teen and teen years and may continue throughout adulthood. Some babies even develop dandruff after birth, called “cradle cap.” Some medical conditions are also likely to cause dandruff, such as those with skin conditions (ex. psoriasis or eczema). People with scalp psoriasis or eczema may notice worsening of dandruff during a flare-up. Unfortunately there’s no magic treatment to cure dandruff, but it can be effectively controlled. People often make a mistake and believe that over shampooing or over brushing the hair can remedy the dandruff, but it can actually be damaging to the hair. Instead, use dandruff shampoo and scalp treatments—these will usually improve mild to moderate dandruff. If your dandruff doesn’t get better in a few weeks after trying the over-the-counter products, then you should see your primary care provider (PCP) or dermatologist. If your dandruff is severe, then your PCP will likely give you a prescription for stronger dandruff shampoos and other dandruff products such as creams and lotions. What shampoos can I use to help get rid of my dandruff? There are five types of active ingredients that are found in over-the-counter dandruff shampoos. In general, dandruff shampoos are classified according to the medication they contain. Antifungal shampoos kill any scalp fungus that may be causing dandruff. Some shampoos (such as Head & Shoulders®) contain an antifungal agent called zinc pyrithione. Ketoconazole containing shampoo (such as Nizoral 1%®) is also antifungal and is best used for treating seborrheic dermatitis of the face. Tar-based shampoos (such as Neutrogena T/Gel®) slow down the rate by which skin cells on your scalp die and flake off. Selenium sulfide shampoos (such as Selsun Blue®) have both antifungal activity and they also slow the rate of shedding skin. How often should I shampoo to get rid of my dandruff? Each dandruff shampoo is different so make sure to follow the instructions on the product before washing your hair. You should shampoo daily and use the dandruff shampoos 2-3 times a week until your dandruff is controlled. Be sure to massage it in well and rinse it out completely. If you’ve tried the over-the-counter dandruff shampoos for several weeks but you don’t see any improvement, make an appointment with your PCP or dermatologist. 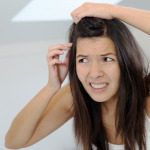 How effective is dandruff treatment? Dandruff treatment can be very effective. But it may take a while to find the best treatment for you and get the results you want. The good news is that there are many different types of treatments so if one doesn’t work, another one may help! Although flaking should get better with treatment, you may want to wear light colored clothing until you notice a difference on your scalp. The white and yellow flakes tend to be noticed more on dark clothing. Keeping your hair up in a ponytail or bun may help because your hair will move less, which may help stop flakes from falling from your head.